We are in the world of Birkeland. He also widely observed this configuration, from which he published numerous scientific articles. This is with these observations that he demonstrated the mechanism of the polar lights. He came to William Thomson [1824-1907] (not to be confused with JJ Thomson [1856-1940], the physicist who had discovered the electron in 1897). But Thomson did not believe Birkeland’s theory: "where electrons exit, there must also be protons. Where are they? ". Soon, Thomson claimed to have the correct theory of the aurora, theory which he never published. However, knighted under the name of Lord Kelvin, he explained the phenomenum of temperature, and therefore the absolute zero. He invented the absolute temperature scale (which we call today the Kelvin). Very smartly, he kept the same difference between two degrees in the Kelvin scale as in the Celsius scale. Let’s come back to the Birkeland’s configuration of the Terrella. The electric duct - now a star - shoots the electrons perpendicularly to the magnetic axis of the planet. Birkeland had suspended his unique sphere in his vacuum chamber and his configuration made it very difficult to experiment other configurations. The pressure inside the chamber can change (from ten to one hundred Pascal). The influence of the electric intensity is low: from 300 V and up to 3000 V, we see little gaps. (Note for physicists, this corresponds to energy electron ... 300 to 3000 eV. It is Gronoff Guillaume who observed and photographed the largest number of cases, retrieving patiently all the original configurations already seen by K. Birkeland, and still more. When the pressure is about one hundred Pascal, the auroral ovals are emerging around the magnetic poles. But if the pressure drops, a ring appears around the sphere, whose feet are the auroral oval. The ring is always présent but depending on the pressure, it is not always visible. It is even more spectacular in a different configuration shown on this site. It exists around the Earth, where it was discovered by James Van Allen in 1959, at the start of the space age. What does one see ? The electrons are shot by the duct – star, which is then called an « electron gun ». They have to go to the sphere because of the the existence of an electric field between them. This field exists simply because the duct is connected to the minus pole of the electric generator and the sphere is connected to the plus. 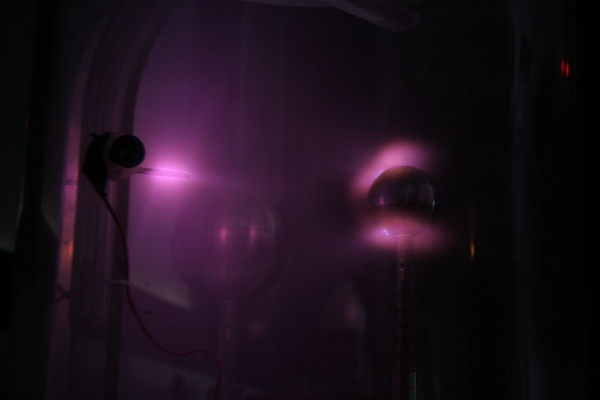 When arriving close to the sphere, the electrons start to expérience the effect of the magnetic field. The closer to the sphere, the higher the intensity of the magnetic field is. The effect of this growth is to force the electrons to turn around the sphere (for the physicists : this is a gradient drift). There, they hit the gaz still présent, simply a very rarefied air. These collisions excite and ionize the gas, which is a mixture of nitrogen and oxygen. When the air goes back to equilibrium, it releases its energy as light : this is the origin of the polar lights, and of the emissions visible in the Planeterrella. But in this configuration, soon or later, the electrons will expérience a collision which will deviate them toward the poles. They concentrate around the poles and again hit the atmosphère. The light is more intense on the auroral ovals because the density of electrons is higher. There are numerous websites that display pictures of the auroral ovals. I selected those taken by a US NASA spacecraft : Dynamics explorer, which flew from 1981 to 1991. Although they are a bit old, I keep finding them very emotional. They can be retrieved with their description on the official site. 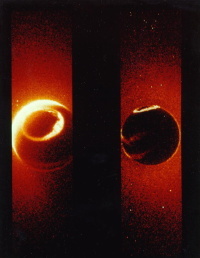 Pictures of the auroral ovals of Jupiter and Saturn are available on the web site of the Hubble space telescope.